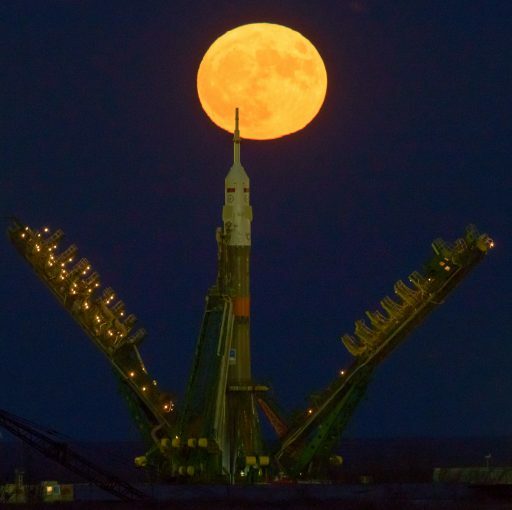 The 49.5-meter tall Soyuz rocket emerged from its assembly building at the traditional early morning hour on Monday to move to Site 1/5 at the storied Kazakh launch base in readiness for a Thursday night liftoff to send a crew from Russia, France and the U.S. on a two-day journey to the orbiting laboratory. Soyuz MS-03 with commander Oleg Novitskiy and Flight Engineers Thomas Pesquet and Peggy Whitson is aiming for liftoff at 20:20 UTC on Thursday to begin a half-year mission as part of International Space Station Expedition 50/51. This is the second crewed mission to depart from Baikonur in the span of only four weeks, following the successful launch of the Soyuz MS-02 vehicle on October 19, bringing Shane Kimbrough, Sergei Ryzhikov and Andrei Borisenko to their orbital workplace after a four-week launch delay due to technical issues with their spacecraft. They are currently staffing ISS as a three-man team and eagerly awaiting the second half of the crew to close out the year with a busy visiting vehicle schedule and science program as well as a series of planned spacewalks in December and January. 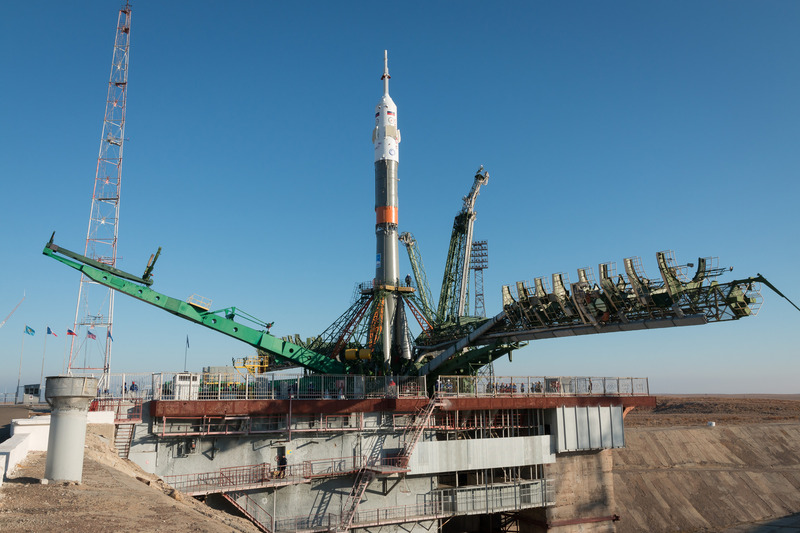 It was a busy period at the Cosmodrome’s Site 254 where, in September and October, work was underway to repair the Soyuz MS-02 spacecraft while MS-03 was kept on schedule for a November liftoff – also as a possible replacement for MS-02 had the problem not been solved by late October. After MS-02 left the facility on October 13, teams focused on readying the MS-03 spacecraft for propellant loading. 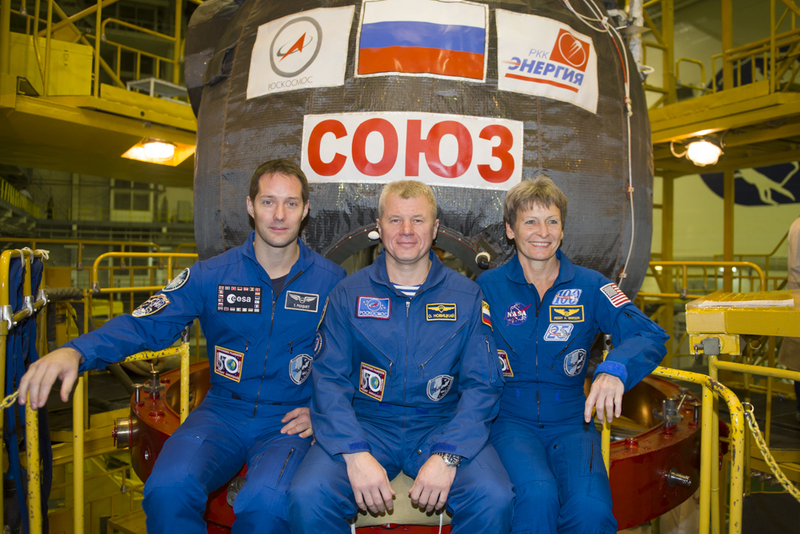 The three MS-03 crew members arrived at the Cosmodrome on November 1st along with their backups, veteran Soyuz Commander Fyodor Yurchikhin and Flight Engineers Paolo Nespoli and Jack Fisher. Going through the typical two-week launch campaign at the Cosmodrome, the crew started with a visit to their Soyuz spacecraft the day after their arrival before putting on their Sokol Launch and Entry Suits for a fit check and ingress exercise. As part of their pre-launch stay at Baikonur, the crew also participated in the traditional flag-raising and tree-planting ceremonies and visited the Cosmodrome museum. They also go through final technical meetings and docking simulations as well as a daily session on tilt tables to prepare their bodies for microgravity. 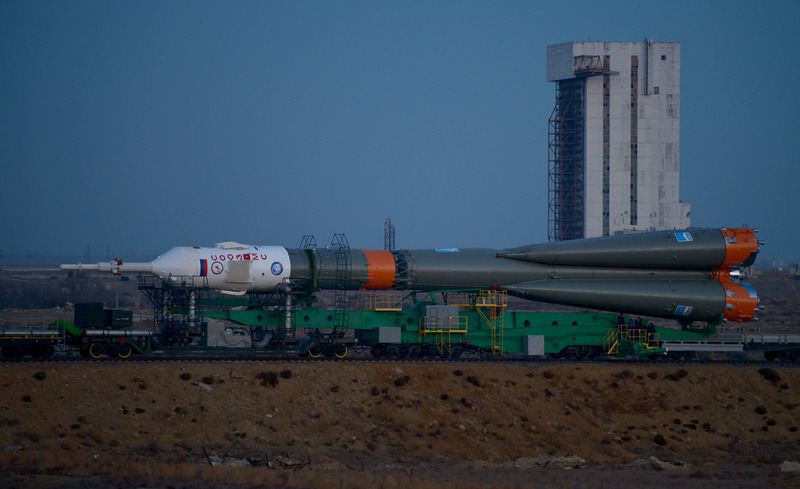 Fully-fueled with 800kg of self-igniting propellants, Soyuz had its payload adapter installed on the 7th, underwent a last set of inspections, and was placed inside its launch shroud on November 9. The three crew members went to Site 254 again when Soyuz was encapsulated, conducing a last inspection of the spacecraft and the cargo loaded in the last few days of processing. While at the processing facility, the three crew members also checked out the Progress MS-04 cargo ship that is sitting in a test stand near to the Soyuz as it prepares for a December 1st liftoff. On Friday, Soyuz MS-03 took a ride over to the MIK-112 launcher integration building where its Soyuz FG rocket was waiting for the spacecraft to finish assembly over the weekend. The four liquid-fueled boosters had already been integrated with the 27.8-meter long Core Stage over the past weeks, leaving only the upper section to be integrated. Engineers attached the encapsulated spacecraft to the Block I upper stage and installed the Launch Escape Tower before the upper composite was mated with the core stage, marking the completion of launch vehicle assembly on Sunday. 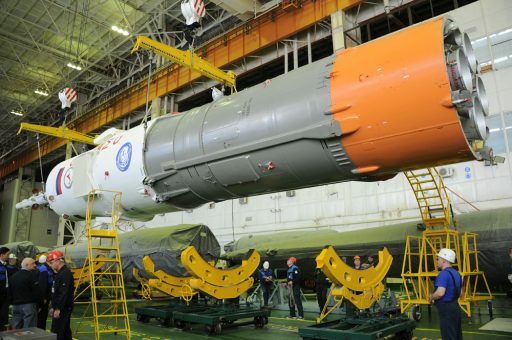 The Russian State Commission met in the evening on Sunday to review the status of launch vehicle assembly and testing, clearing the way for the rollout. 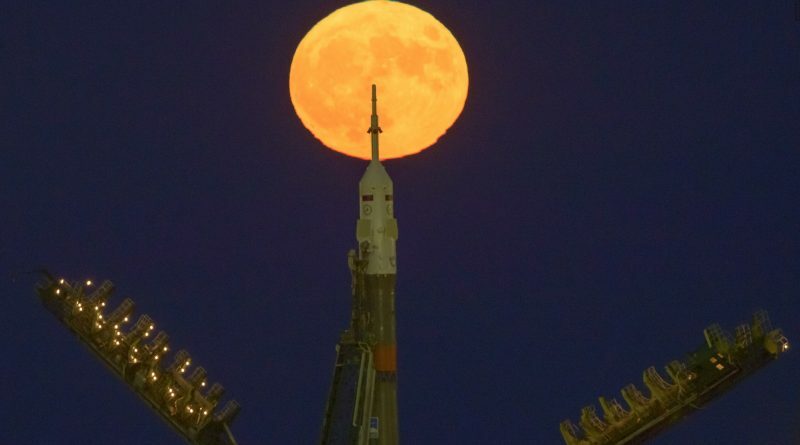 Many had gathered to watch Soyuz depart its assembly facility while it was still dark on Monday to begin its trip to the historic Site 1/5 that supported over 500 launches of the R7 family since the dawn of the Space Age with the launches of Sputnik and Yuri Gagarin. Soyuz was greeted by a colorful sunrise before being placed in its vertical launch position under clear blue skies. The two halves of the Soyuz Service Structure were raised and the umbilical masts moved in place to allow technicians to connect the launch vehicle to ground power and propellant umbilicals ahead of extensive testing that is performed as part of a two-day on-pad campaign. 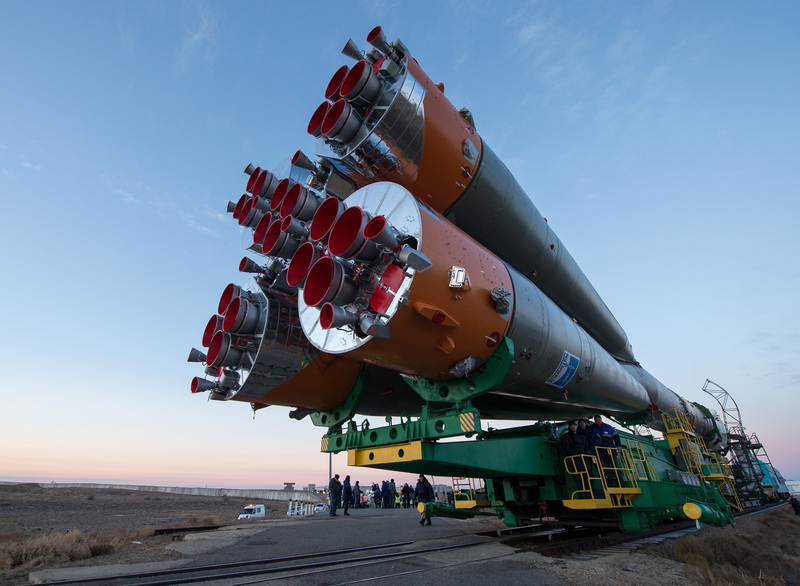 Countdown operations begin in the afternoon hours on Thursday to put in motion final preparations for loading the rocket with 274 metric tons of propellants, starting five hours prior to launch when the sun will have already set over Baikonur. The three crew members will board their spacecraft with two and a half hours on the countdown clock. Soyuz MS-03 is commanded by veteran Soyuz and ISS crew member Oleg Novitskiy who commanded the Soyuz TMA-06M mission in 2012/13 and served as a flight engineer during Expedition 33/34 for a total of 143 days spent in space. 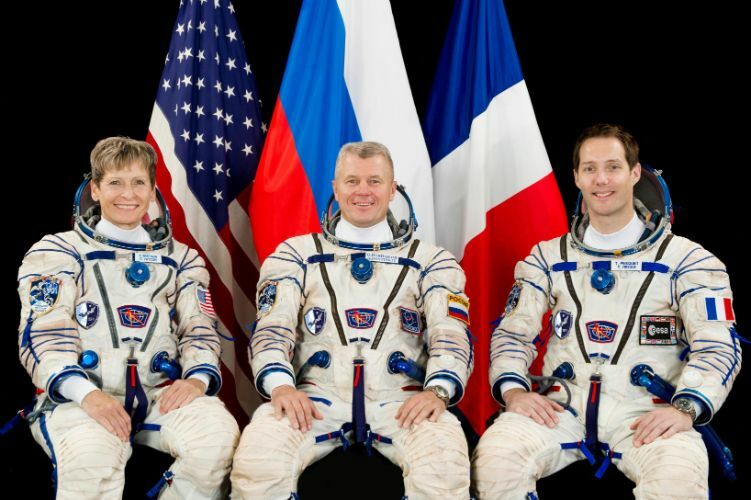 Serving as flight engineer in the left seat is Thomas Pesquet, a European Space Agency Astronaut of French nationality. Pesquet worked as aerospace engineer and airline pilot before being selected by ESA as part of the 2009 class of which he is the last member to fly to space. Peggy Whitson, one of NASA’s most experienced female Astronauts, returns to ISS after two previous long-duration stints. She lived and worked on ISS as part of Expedition 5 in 2002 when the Station was still in its infancy, logging 185 days in space. 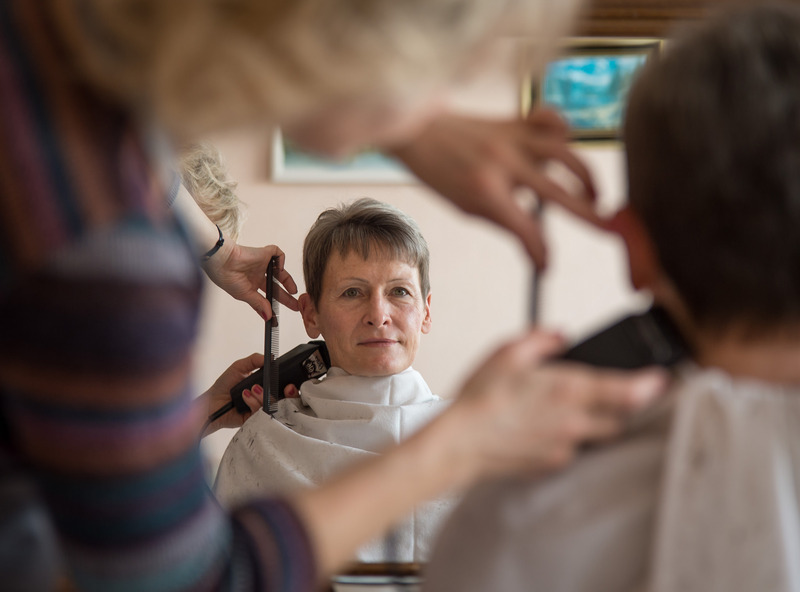 Her next mission was Expedition 16 in 2007/08 – nearly 192 days in duration and ending with a ballistic landing aboard the Soyuz spacecraft, a steeper entry profile exposing the crew to up to ten Gs. In total, Whitson logged 376 days and 18 hours in space, also performing six spacewalks in the Russian Orlan and American EMU space suits for a total of nearly 40 hours. Soyuz MS-03 is targeting a 20:20 UTC liftoff on Thursday, 2:20 a.m. local time in Baikonur, lighting up the night skies along the typical north-easterly departure path to intercept the station’s orbital plane. 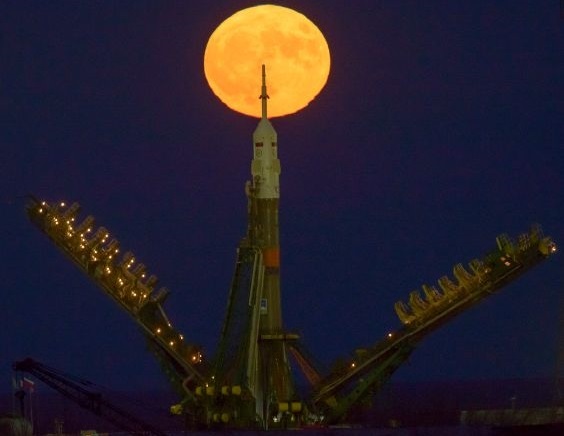 The trusted Soyuz rocket will be in operation for eight minutes and 48 seconds, tasked with delivering the 7,200-Kilogram spacecraft and its crew to an orbit 200 Kilometers above the planet. Soyuz MS-03 will use the longer two-day rendezvous profile that all of the MS-series spacecraft had to fly so far. To facilitate a faster four-orbit rendezvous, a ground station compatible with the new Unified Command and Data System of the Soyuz MS has to finish outfitting in Russia’s far eastern region, at the Vostochny Cosmodrome. This station would track the spacecraft after orbital insertion and uplink parameters for orbital maneuvers conducted on the first lap around the planet to begin the process of raising the spacecraft’s orbit straight away. For the 34-orbit rendezvous, maneuvers don’t start until the third orbit and allow adjusted burn parameters to be uplinked after the first orbit is complete. 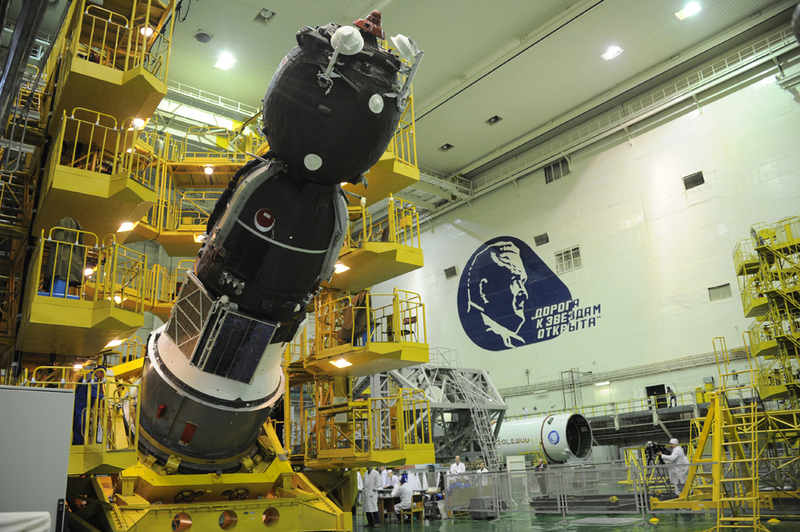 The two-day flight profile also permits more testing to be performed on the newly introduced Soyuz MS systems. Soyuz MS-04 with a provisional launch date of March 5, 2017 is currently expected to be the first MS-class vehicle to make a same day launch and docking. 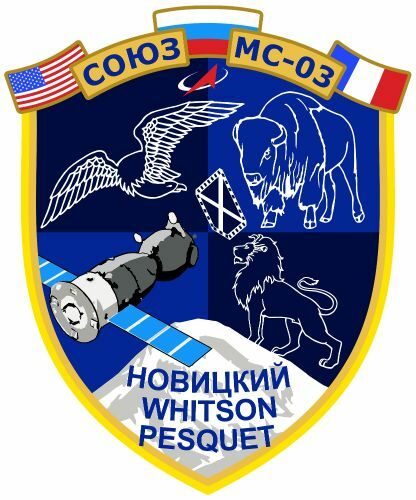 Spending two nights aboard their Soyuz, Novitskiy, Pesquet and Whitson will oversee a fully automated rendezvous on Saturday, culminating in docking to the Rassvet module at 22:01 UTC. The three crew members are currently booked for a stay of 178 days with landing expected on May 16, 2017. Copyright © 2019 Soyuz MS-03 | Spaceflight101. All rights reserved.